Christmas is fast approaching with just over a month to go! Which means it's that time of year again when everyone is preoccupied with Christmas gift lists and preparations. While I'm getting in the festive spirit with my 12 Days of Christmas Competitions. It can be a stressful time but I love Christmas, especially when it comes to trimming the tree, eating delicious seasonal food and getting swept up with my little one's excitement! I also love the festive season because it's also the perfect excuse to rev up my wardrobe. After all, 'tis the season to shine and sparkle! With that in mind, here are some ways to look fabulous, festive and on-trend this Christmas. Velvet has been everywhere this year, from designer catwalks to high street stores and it seems there's no escape from it yet. For those who are a little nervous about the fabric there have been so many ways to embrace this year's ultimate trend, including heels and handbags. But for the festive season it's time to go all out with a velvet jumpsuit, plunging neckline, or off the shoulder maxi dress. When it comes to fashion I don't think anything says Christmas quite as well as a little added sparkle. Sequins are always a festive frock must have and the trend for Christmas 2016 is no exception! If you have the budget, go bold with a head-to-toe sequin dress or embellished trousers, like these amazing options from Coast. Or add a little sparkle with a new glitter highlighter, glitzy choker or bejewelled clutch bag. For years you've never been able to go wrong with a classic LBD. Every magazine tells you it's a true wardrobe staple that will never go out of fashion and can always be restyled. Well, not anymore! Move over little black dress because blue is this year's black! Take your pick from blouses in wintery pale icy blues to bright cobalt shoes, deep royal blue dresses and faux fur blue accessories. Winter fashion is often associated with deep dark colours, luxurious metallics and neutral shades, while summer boasts bright and bold hues. This festive season the world of fashion has decided to change things up a little and introduce a mix of colours into party season looks. So ignore the dark tones and go for pastels, bold prints, or bright in-your-face eye-popping colours. What are your favourite styles for the festive period? Love all the dresses pictured on here, you can't beat sparkle, glitter or metallic for Christmas. I like to go a little bit mad with the glitter make up too! 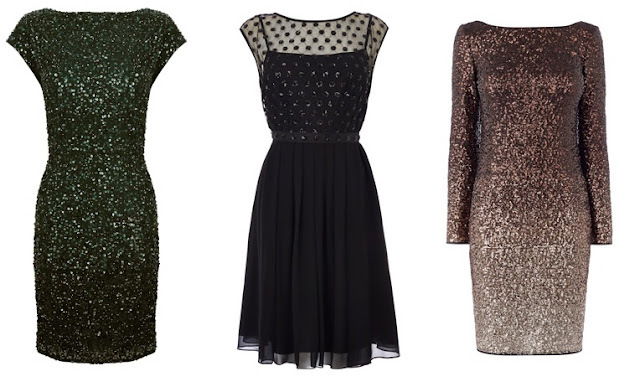 Wow, some really lovely sparkly dresses, particularly like the green one! Velvet is a must for Christmas! Although I work in a dentist and we don't get all glitz and glam for our Xmas night out....we go for crazy Xmas jumpers! Though trends move on, there are some great tips here for any winter party. Inspiring article, thank you!